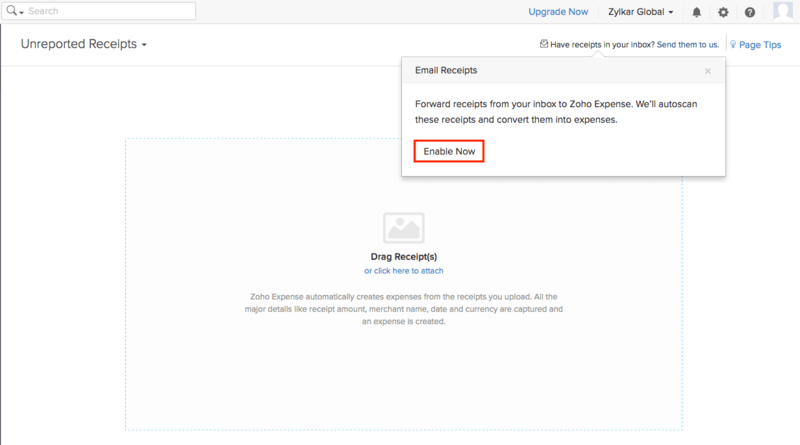 The Receipt Inbox section of Zoho Expense allows you to upload all your receipts before converting them into expense entries. Dragging and dropping files into the Receipt Inbox section. Emailing receipts to your account. Clipping portions from any webpage using the chrome extension. 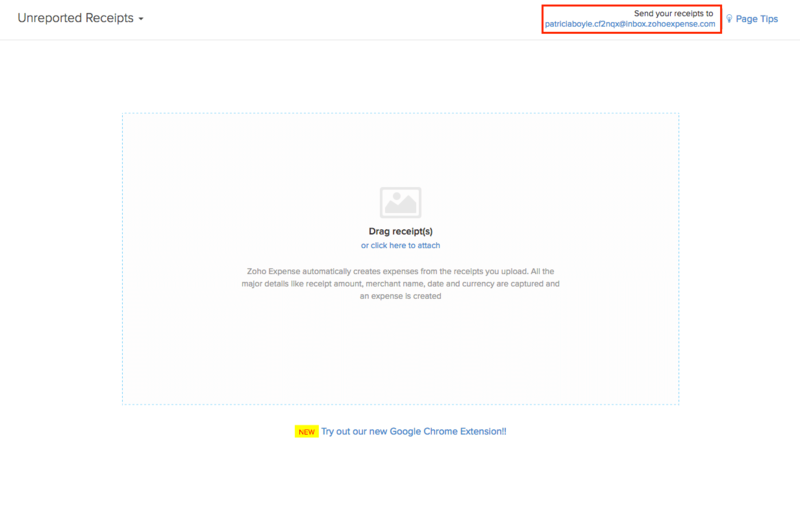 You can clip a portion of any webpage and upload it as a receipt to your Zoho Expense account using the chrome extension. On doing that, you will be asked to clip a portion of the webpage containing data necessary for expense creation. 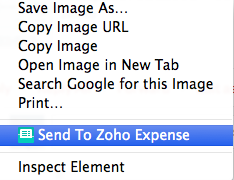 After clipping a portion, upload it as a receipt to your Zoho Expense account. If your receipt is in image format, Right click on the image. Select Send it to Zoho Expense. It will be automatically loaded into your Zoho Expense account. Note: You can also access the extension by right clicking on any portion of the page. 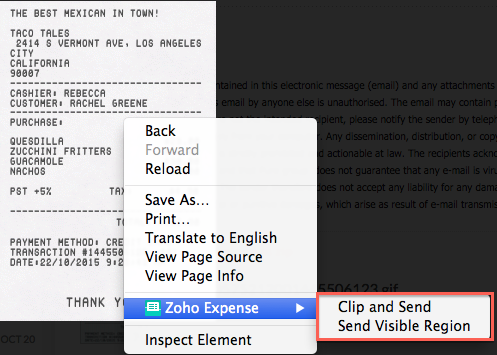 Click on Clip and send option or Send visible region option and upload it to your Zoho Expense account. Note: As of now, the Zoho Expense mobile app for windows phone OS support receipts only in image formats (JPEG and PNG.) The option to attach PDF and DOC files will be available soon. Soon after uploading, the receipts go through the auto scanning process where essential details like date, amount, merchant name, etc. are captured. As of now, auto scanning works only for receipts in the English language. Receipts can also be auto-categorised. The first expense with a new merchant needs to be categorised manually in an organisation. Subsequent expenses containing the same merchant will be auto-categorised during auto-scan. Click on the Drag Receipts box and select from computer option. Press and hold the Shift key while you select the receipts. All your selected receipts will be uploaded into the receipts section. All receipts that you have in your email, such as airline, food and lodging expenses can be forwarded to your Zoho Expense account. This is particularly helpful when you’re on the move or have a large number of receipts that you simply can’t spend time filling the details for. 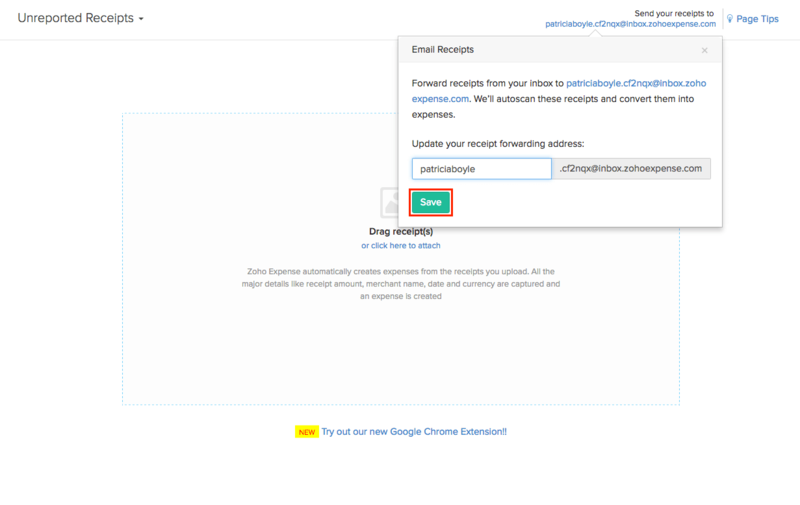 In case you do not see the receipt forwarding address, you can enable this feature from the receipt section. 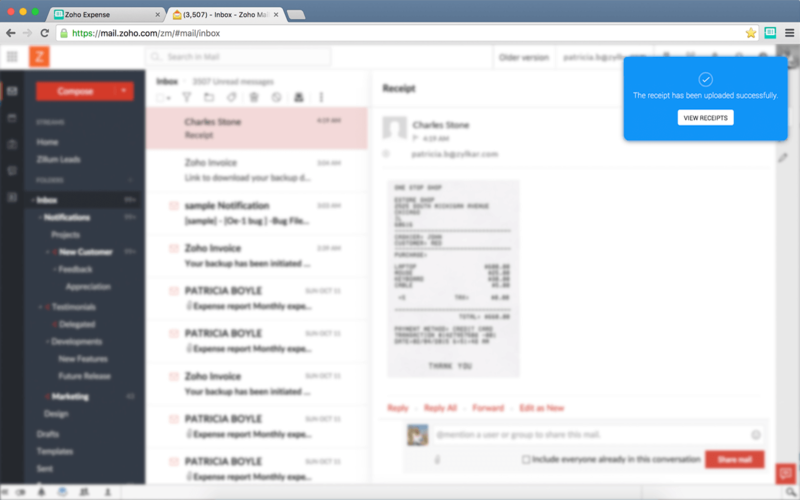 You can send receipts from any email address. The receipt forwarding address is unique to each user. The receipt sent to this address will be auto scanned and converted into expenses entries. To update the Receipt Forwarding Address, select Receipt Inbox on the sidebar and click on the link located on the top right corner. 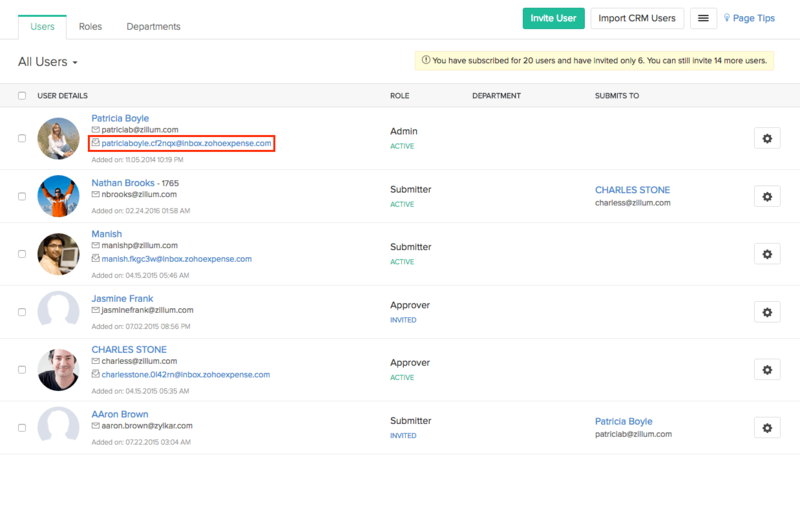 The admin can view the user’s Receipt Forwarding Address in the User section. Only the respective user can edit the Receipt Forwarding Address. Click on the Receipt Inbox section on the left sidebar. Click on the ‘Click here to attach’ link. You will be provided with options to upload receipts from computer, and from cloud. A new window will display all the supported cloud-storage services. Select the cloud account from where you wish to upload your receipt. Click on the authenticate button to provide access to files in your cloud account. Select the file of your choice and click Attach. Note: You can also attach multiple receipts from your cloud account. Go to Receipt Inbox section. Click on the receipt you would like to download. The Edit Expense will pop-up on your screen. Click on the Download icon located next to the trash icon. Multiple receipts can be also download. They are downloaded together in a PDF. Select the receipts you would like to download and click on the Download as PDF button. You can also download receipts belonging to a particular report. 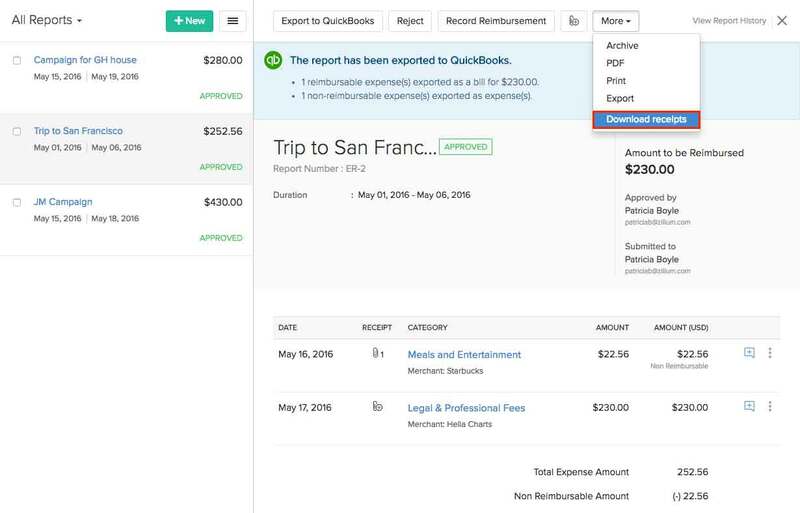 Just go to the report, click on More drop-down and select Download receipts. Receipts will be downloaded as a zip file. 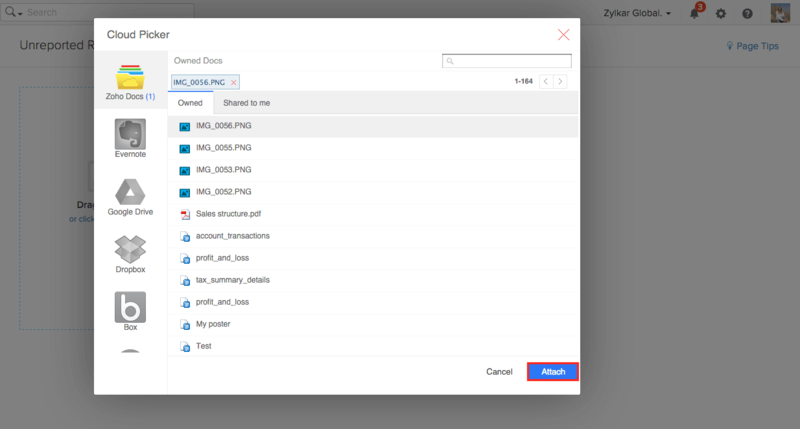 Similar to uploading receipts from your cloud account, there is also an option to save your uploaded receipts on to your cloud accounts. 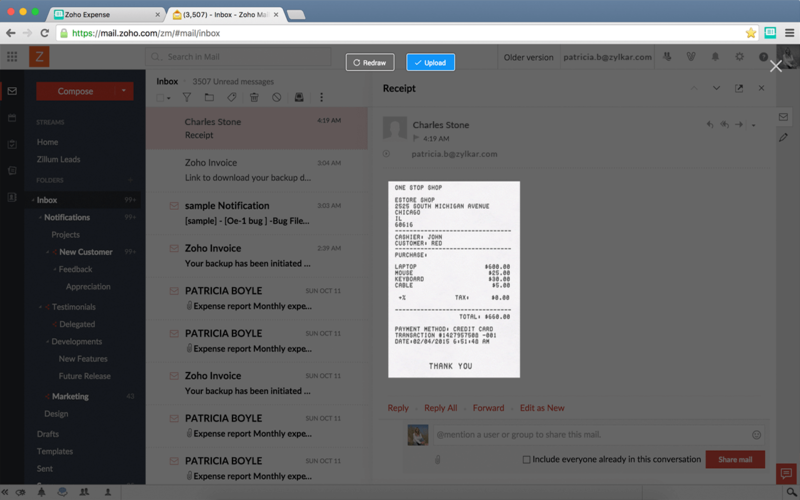 Hover your mouse over the receipt which you would like to store onto your cloud account, and click on the Maximize icon. Your selected receipt will appear in full-screen mode. Click on the download icon on the right bottom corner and select Add To Cloud. A new pop-up window will appear, displaying the list of cloud services to which you could save your receipt. Choose your cloud account to complete the process. Hover your mouse over the receipt which you would like to delete. Click on the Delete icon present on the bottom right corner of the receipt. Select the checkbox present on the top right corner of each receipt that you would like to delete. Click on the Delete icon on the top of the receipts section to delete all the selected receipts. 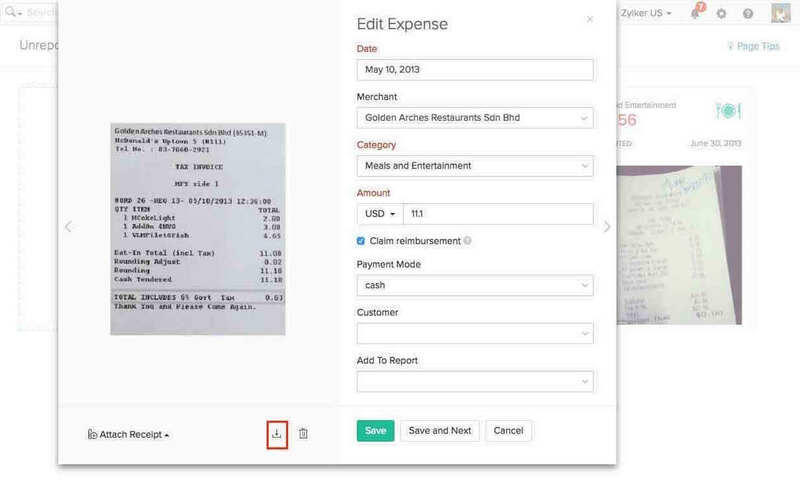 Unreported Receipts - Displays receipts that are not a part of any expense report. 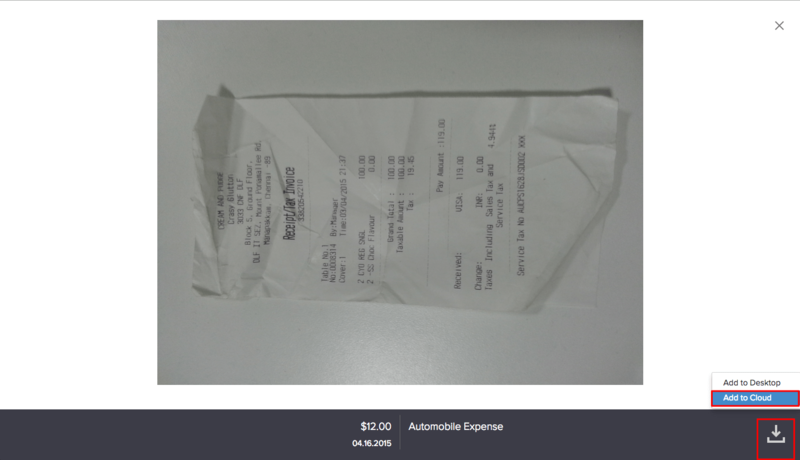 Scan Failed Receipts - Displays receipts that did not go through the auto scanning process.